Why did we choose Booking.com as our accommodation booking system? We examined numerous other hotel booking systems before finally settling on booking.com. Various factors which we considered included ease of use, range of accommodations on offer, worldwide reach, information provided, imagery, customer reviews, security, pricing/deals and much more. Update 13th February 2018: Booking.com continues to be the leading accommodation booking facility worldwide. The user interface is quite friendly and the search facility is quite intuitive. You can search for accommodation in a city, region, district or for a specific hotel. For example, if you enter 3Arena in the search, it will list all the accommodations showing the distance from 3Arena (formerly the O2 venue in Dublin). You can further filter the results by type, star rating, review score etc to find exactly what you want. Results can also be sorted by price range etc. Booking.com has over 800,000 accommodations worldwide and this number is rapidly growing. Many of their competitors have a good range of hotels but what we found is that booking.com has the widest rang of accommodation types including hotels, bed and breakfasts (B&B), guest houses, hostels, self catering apartments, chalets, resorts and more. 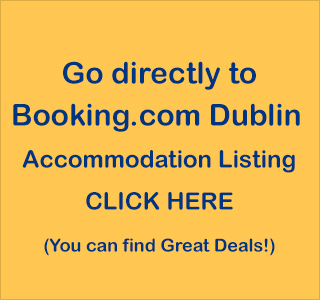 Booking.com Dublin has the best and most varied range of accommodation in Dublin City and County. For property owners who want to make their property available online, it is important to know that it will reach the widest possible audience. Booking.com is by far the most popular accommodation website worldwide. Most visitors want to get good information about an accommodation before booking. Important information includes star rating, room types, in room facilities, restaurant/bar information, parking, location and nearby attractions. Booking.com provides all this information clearly. Most impressive and easily understood is the array of images of all aspects of the accommodation (exterior, reception, rooms, bar, restaurant). Also, a Google map shows the location with nearby attractions as well as other accommodations in the vicinity. This reduces the possibility of visitors finding that the accommodation they have booked does not measure up to their expectations. In choosing Booking.com Dublin Overnight provides great deals, ease of use, wide accommodation range, lots of pictures, customer reviews, security. The customer reviews are by real customers who have actually stayed in a property which means that they are reliable and can’t be easily manipulated. Agood feature is that the reviews can be sorted in many ways including by traveller types: business travellers, families, couples, groups and solo travellers. This helps in finding accommodation suited to your particular preferences. Prices are easily understood on booking.com. As soon as you Search for your chosen dates and number of guests you will be shown listings with the total price for the full duration. 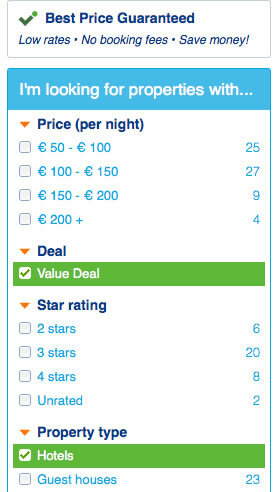 We think this is better than showing the price per night as it gives a clearer picture of the total cost of your stay. There are regular discounts on some dates and these are clearly marked in red on the listings. We have seen discounts of up to 66% on the regular price, so it is worth checking around. If you want to see only properties that have deals use the filter on the left. See our guide on choosing a Dublin Hotel on Booking .com. In the end, it was a “no-brainer”. Booking.com ticked all the boxes.